A couple of weeks back, I wrote about the Six (Almost Free and) Free Digital Marketing Steps Essential to Your Business. While I didn’t make the distinction, I presumed that five of these six steps (claiming a Facebook Place, claiming a Venue on Foursquare, claiming a business on Google, claiming a business on Bing and claiming a business on Yelp) didn’t apply to me, a consultant. It still doesn’t make sense for me to involve my independent, work-from-home consulting company with Facebook Places, Foursquare or Yelp. But Google and Bing? I missed the early boat on those two. It was a poor oversight on my part. Companies (including individuals) that create and claim these places are at an SEO advantage. Or, to be more clear, those who don’t are at a disadvantage. If you have a brick and mortar business, chances are that you already have a Place on Google and Bing. You’ll just need to claim the place so that you can take control of it. But individual consultants who don’t take the opportunity will be left in the dust. There’s little reason for those places to be created if the owner is left in ignorance. Quick refresher on what this all means. I live in Parker, CO. Now, my clients aren’t only in the Parker and Denver area. Most are not. But I know the power of local. If I become well known in the area as the go-to guy for digital marketing and social media, I suddenly don’t need business outside of the area. It’s much more difficult to become “that guy” everyone goes to globally. Obviously, there’s a whole lot more competition… being the world and whatnot. But how do I become the go-to guy for social media and digital marketing in the Parker and Denver area? It starts with SEO. I should note that if I click the link to view more results, two of the 10 businesses don’t list a physical location. In other words, they are consultants or at-home businesses. So what are we waiting for? Brick and mortar or not, we need to get you set up. The process isn’t all that difficult, though it will take some time for verification. Go here and then click on Get Started. You will then be required to enter your business phone number so that they can connect you with your place if it was already previously created. Otherwise, you’ll create a new place. You will then be required to enter basic information: address, email address, website, phone number, description and business category. Here you can also indicate whether you have a physical location or go to the location of your customers (as well as the range of locations you serve). The key for the consultant would be to select that the business serves customers at their locations and to check the box for Do not show my business address on my Maps listing. Now, the areas you serve gets interesting. You probably aren’t bound to geography. But for this purpose, you want to appeal to a local customer. Personally, I’m selecting anyone within a 100 mile radius of Parker. Finally, you can add (or not add) hours of operation, payment options, photos, videos or any other details you’d like to provide. If you want to differentiate yourself from other local businesses, this is a good place to do it with photos of you, logos, screen shots of your work, etc. A video introducing yourself would also be nice. That’s really it. When you’re done, they’ll mail you a postcard with a PIN number on it that you’ll need to enter for confirmation. After that, your listing will appear. Setting up your business on Bing isn’t all that different. Go to the Bing Business Portal and click on Get Started Now. The process is largely the same. You provide your business details, classification, photos and video, etc. 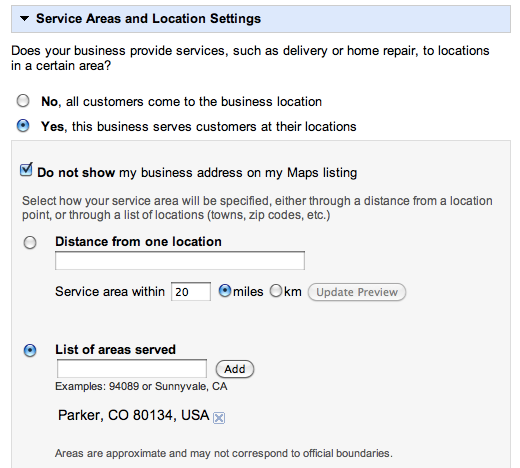 You are also given a check box when entering your address for Do not display the address of my business (consultants!). Bing gives you a few other options, however. You can list specialities and split them in proportion to what you do most. You can get a free mobile website, create a QR code and allow for ordering by smartphones. You can also add individual products that you wish to sell, create events and create deals. We’ll take a look at those some other time. But know that they are there. So when you’re done, Bing will send you a post card and you’ll need to verify your business. That’s it. My entries have not yet been confirmed. I am sure there will be some tinkering with my company description so that I show up in the proper search results. And I’m also considering creating a new video specifically for this purpose. But I’m curious as to what impact this will make on my business. How about you? Are you a consultant or at-home business owner who listed your business on Google or Bing? Are you seeing results?